I usually don't read books this fast but I read this one in a day. 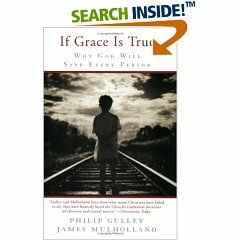 If Grace Is True give us a fairly thorough explanation of universalism (well, they call themselves that but it's actually inclusivism if you wanna get technical). This is the view that the God of the bible will save everyone and hell will be totally empty. This is an attractive view in contemporary Christianity and it is increasingly popular due, at least in part, to postmodernism and the moral relativism that seems to come naturally from that. Now I tend to have a very optimistic view of universalism. It tries to harmonize God's Grace with His justice, Heaven with Hell, retribution with Salvation, wrath with mercy, etc. Although I have a high understanding of tradition I actually have a great respect for theologians who are brave enough to leave tradition and think this freely. As irreverent and even disrespectful as it may be I admire them. But as the authors of this book admitted the Bible say too much about hell and wrath for it to be that easy. Now, when reading scripture you have to think like the author thought when he/she wrote the text. That means you’ve got to think like a Hebrew. There's a lot to explain about Hebrew thinking vs. Greek thinking but one simple explanation I once heard is that in Hebrew thinking "everything I in tension" one truth always pushes and pulls on another truth. It's elastic whereas Greek thinking is much more static. (See Follow The Rabbi for a more thorough explanation). That's why there seems to be so many paradoxes in Scripture... because there are. It's all "in tension". In the past we've failed to allow this tension. That, I believe, is why we have staunchly Calvinist theologies and, on the other extreme, Arminianism. It's because we hate paradoxes and we can't sit comfortably with the paradox of human free will and divine sovereignty. This is just one example. These authors, Guilly and Mulholland, are only one step away from saying all will go to Hell. In order to resolve a paradox which may have never been meant to resolve they have decided that Scripture is not equally true throughout. In other words the writers of scripture were mistaken about Hell and God’s wrath. Joshua is used as an example. Joshua killed women and children in the Promised Land and the text says that it is because God commanded him to do so. Since that seems contrary to what we would like God to be like and what some other parts of scripture say about Him the authors of this book have rationalized it. They suggest that the author of Joshua was simply mistaken and that Jesus came to correct those kinds of mistakes about God’s character. This is their explanation of the paradox of God’s wrath: that it was a mistake of the ancient authors and God is not wrathful at all. They are choosing what parts of scripture are true and false based on their life experiences. They believe that God has proven His love and His grace through life experience. I would suggest that another person’s experience could bring them to an opposite conclusion. Life sometimes makes God seem very wrathful. Just look at the news headlines; tsunamis, hurricanes, Forrest fires, floods, earthquakes, world hunger, global warming, all this must mean God is punishing us. How do we know He isn’t? Because we have scripture’s assurance that God is with us in our pain. But what if the part that says God is with us is a mistake. What if Jesus was mistaken in His “corrections” of Old Testament thinking? And what about the places where Jesus seems wrathful? What about when Jesus seems paradoxical? Their arguments carried little weight to me simply because they don’t have any view of Biblical authority. It is a beautiful book to them but it holds less authority than life experience. These authors have failed to deal responsibly with the biblical text. They are explaining away the paradoxes just like the fundamentalists try to do. Other than the low view of scripture held in this book the book carries fairly good arguments. They seem primarily concerned with the way we treat people because of our theologies. Their concern is more for peoples life than for their “eternal destination.” I share with them in this concern. Heaven and Hell after death comes second to the Heaven and Hell on Earth on the priority list. If we believe that the Scripture is authoritative and that Hell exists somehow but we are hatful and angry people then the scripture has had no authority over our lives. No matter how “solid” your theology is if you don’t love others you are not following Christ. So in that regard these authors are on to something. But as for soteriology they’ve failed to handle the tension within Scripture with an authoritative view of it. Who will eat at the feast table may surprise us, it may be much more mysterious than accepting Jesus into our hearts but I can’t ignore that in the end there are some who are not allowed in (Revelation 21:8 and 27). There have to be some Universalist/Inclusivists out there who are willing to approach the whole Scriptures as more than just mistaken theologies, who hold the Scripture as true throughout at least in matters of faith and practice. I wish one of them would write a book.